On Monday night, Jim Wallmann drove north from broiling Phoenix toward a bustling command post for the Yarnell Hill fire near Prescott, Ariz. The blaze had killed 19 of the 20-member crew of elite “Hotshots” a day earlier in the worst loss of firefighters in a single wildfire in 80 years. With erratic weather conditions viewed as the primary suspect behind the tragedy, Wallman had been called to the blaze specifically to prevent a repeat incident by keeping firefighters informed of changing weather conditions. As one of 85 specially trained incident meteorologists, or IMETs, within the National Weather Service, Wallmann has knowledge of “microscale” weather forecasting, including anticipating highly localized and chaotic winds in the vicinity of individual thunderstorms. Importantly, like other IMETs at the agency, Wallmann also has expertise in firefighting operations. That combination makes him a critical asset to the incident command staff and the hundreds of firefighters that raced to the scene of the fire since the accident on June 30. 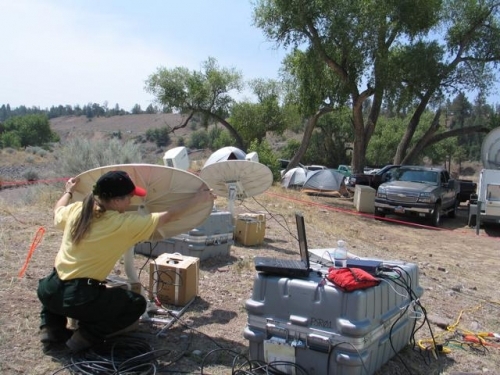 Deployed to the front lines of volatile incidents ranging from wildfires to chemical and oil spills, IMETs are the National Weather Service’s equivalent of special forces, sent to the vanguard to provide on-site forecasting support. In fact, like members of the military, IMETs have even been sent abroad as they've assisted Australia in battling severe wildfires in recent years. After getting the order to deploy on the morning of July 1, it took Wallmann nearly 24 hours to reach the fire command center, due to a delayed flight out of Reno, Nev., and battling fatigue while driving from the Phoenix airport through sparsely populated areas in the midst of a record heat wave. Speaking to Climate Central on Tuesday afternoon amid the din of landing and departing helicopters at the Yarnell Hill fire command center, Wallmann said he is trying to give fire crews as much situational awareness as possible given the variable weather conditions in the region, with afternoon thunderstorms expected for much of the week, some of which may be capable of producing sudden wind gusts of 60 to 80 mph at times. “It’s somewhat tough, we’re all aware of what went on two days ago,” Wallmann said. “As much as what happened is in the back of our minds, we’re just really focused on the task at hand.” As of Wednesday morning, the blaze was still only 8 percent contained. Wallmann said that, on average, he can provide firefighters with a warning of incoming storms at least 45 minutes in advance, but that varies depending on where thunderstorms form. Could an IMET Have Saved Those Firefighters? At a press conference in Maryland on Tuesday, acting National Oceanic and Atmospheric Administration (NOAA) administrator Kathryn Sullivan said that an IMET could have made a decisive difference, possibly saving firefighters’ lives, had one been deployed on June 30. 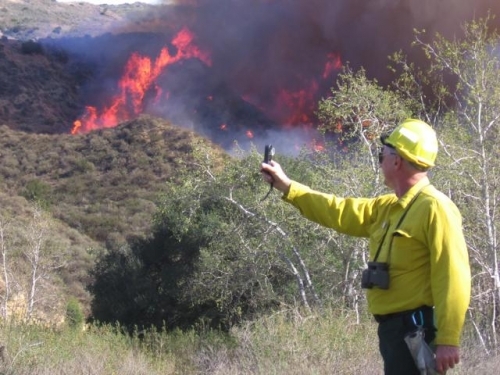 A NOAA incident meteorologist at the scene of a wildfire. But IMETs deploy from their usual assignments (as forecasters at local NWS offices) at the request of incident commanders. On June 30, when the Granite Mountain Hotshot crew was overrun by the fire, the Yarnell Hill blaze was not classified as a “Type 1 Incident,” which automatically triggers IMETs to deploy, said Larry Van Bussum, National Fire Weather Operations Coordinator for the National Weather Service in Boise, Idaho. “They (incident commanders) ask for IMET support when they ask for it, and we don’t have any say as to what kinds of teams are put on an incident,” Van Bussum said. Randy Eardely, a spokesman for the National Interagency Fire Center in Boise, said IMETs are “almost never requested” for small-range fires like the Yarnell Hill fire was prior to its dramatic expansion on June 30, when the blaze more than quadrupled in size due to perilous weather conditions — a combustible mix of triple-digit heat, low humidity, a large amount of dry vegetation in the path of the fire, and strong winds. Van Bussum said the request for an IMET came in at 7:30 a.m. local time on July 1, once the wildfire had grown, overtaken the Hotshot crew, and had destroyed property, thereby necessitating many more firefighting resources than had been allocated the previous day. On June 30, the NWS did provide localized weather forecast information for the Yarnell Hill fire despite the lack of an IMET, with two “spot forecasts” requested by incident commanders and issued by the NWS office in Flagstaff. Additionally, phone calls from the NWS office to commanders warned of approaching thunderstorms, according to news reports. 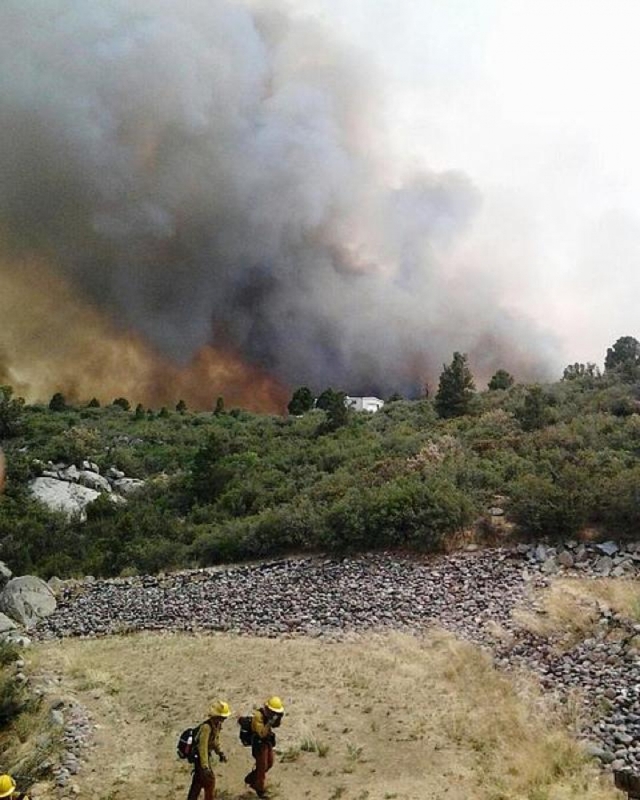 Wallman said the spot forecasts and phone calls meant that firefighters had advanced notice that thunderstorms with gusty and variable winds were likely on Sunday afternoon. When they deploy to the scene of an incident, IMETs carry several tools of the trade to allow them to tap into streams of weather data. “We are equipped to basically be a weather office, but a mobile weather office,” said Lisa Kriederman, an IMET and forecaster at the NWS' Denver forecast office. Kriederman, who deployed to the devastating Waldo Canyon Fire in Colorado Springs last year, and has already been dispatched to three wildfires this season, said the standard instrument package most often consists of a laptop with a weather forecasting program installed on it, along with a portable modem and satellite connection, a printer, and an instrument to launch and track weather balloons to gain insight into weather conditions aloft. A NOAA incident meteorologist setting up equipment at a wildfire incident command post. When deployed, IMETs also carry instruments on their belts to allow them to do “spot checks” of temperature, humidity, and wind direction and speed, she said. Firefighters battling active wildfires around the country will take a brief pause Wednesday to honor the fallen at Yarnell Hill. Although the NWS is facing budget constraints due to the sequester, with a hiring freeze in place agency-wide that has left many forecast offices short-staffed, Van Bussum and others interviewed for this article said the NWS continues to meet every IMET deployment request. “To my knowledge, in almost 100 years of this program, we have never once turned down a request,” Van Bussum said. That continues to be the case even though IMET deployments can put short-staffed offices under more strain than usual. Rick Davis, an IMET who is based at the NWS office in Destin, Fla., said that instead of pushback against deployments due to budgetary constraints, he foresees a potential expansion of the program based on the Weather Service’s “Weather Ready Nation” initiative that seeks to bolster public preparedness for severe-weather threats.